"To be a proficient teacher, one must do two things on a continuous basis: Continue to work on his own game and continue to learn. I would never take a lesson from someone who has not successfully competed on a professional level. Why? Because I would never ask a student to do something that I could not do myself in a competitive environment." Many people who contact me for golf instruction often ask "What is your teaching philosophy". I always respond by saying "I analyze ball flight and relate that to impact and swing shape. All we are trying to do in golf is produce a correct, consistent, repetitive impact and the means of employment is of no significance. We often hear golfers talk about swinging the club on plane. That is so very important in hitting consistent golf shots because all missed shots are caused by either being too much above the plane or too much below. It is the correct angle of approach that produces consistency. That's why you see so many different swings that produce great shots. You then must ask yourself a question. Do you want to find your golf ball or look pretty swinging?" "Three people have influenced and contributed to my knowledge of instruction. Byron Nelson taught me the short game and course management, and when to play certain shots in critical situations. Carl Lohren taught me the back-swing and Jim Hardy concentrated on the forward swing as well as the back-swing." "By taking all this information and applying it to myself allows me to help every golfer at any level no matter what degree of talent they possess." 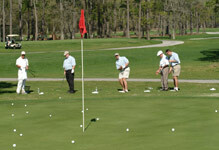 Marty Fleckman is a world-class golf instructor that provides top-notch individual instruction. It’s an invaluable resource for everyone from juniors to weekend players, all the way up to touring pros. Marty breaks the game of golf down into its elements to teach you to play it the way it should be played. Develop proper technique by utilizing the V-1 Digital Coach video analysis technology. This frame-by-frame analysis of your swing allows Marty to make rapid adjustments to your technique. Marty will help you develop the proper short game techniques – sand play, chipping, pitching and putting. You’ll also master the pre-shot routine to properly aim and line up your shot. Finally, you’ll learn the concepts of course management, taught to Marty by one of the legends of golf, Byron Nelson. Marty is comfortable instructing groups of all sizes and skill levels. Benefit from the years of PGA tour experience that Marty brings to the table. It’s an invaluable resource for everyone from juniors to weekend players, all the way up to touring pros. Marty breaks the game of golf down into its elements to teach you to play it the way it should be played. Discover how much your game can improve and share it with a group of friends or co-workers by scheduling a group lesson. Develop proper technique utilizing the V-1 Digital Coach video analysis technology for frame-by-frame analysis of your swing. Through the use of the latest technology and world-class experience, Marty will help you acquire the proper short game techniques – sand play, chipping, pitching and putting. You’ll also master the pre-shot routine that helps you aim and line up your shot. Finally, you’ll learn the concepts of course management, taught to Marty by one of the legends of golf, Byron Nelson. 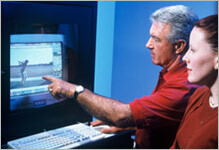 Thru the V-1 Digital Coach video system, you will see how a picture can be worth 1000 words. It is not until you can take a new swing thought and convert it into a feeling, that you will be able to consistently repeat them. Being able to see, thru video analysis, what you are feeling is necessary for repeatable swings. By combining this process and comparing each student's swing to our library of great, past and present PGA Tour players, you are able to drastically accelerate your progress.